Mummers! What a grand Newfoundland tradition! From Christmas until Twelfth Night (January 6), people dress up in crazy outfits and travel from house to house, asking to be let in to sing a song, have a dance and down a drink. Ian captures the fun and frivolity of this spirited old song with his lively pictures of folks in home-made costumes making merry. It's a grey and wintry world outside, but inside it is warm and bright. The house is a welcoming one, full of furniture, knick-knacks and pictures on the walls. It is all done in soft, muted tones that suggest a warm and loving family in their cozy house. 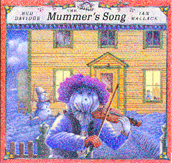 There is a brief history of mummering by Kevin Major and music to accompany the song. Ian uses small, snapshot-like pictures to illustrate the story of a girl visiting her grandfather during sugaring-off season. She has come to help with chores and to listen to his stories. As she stares into the fire, she asks her grandfather if he had ever seen a bigger fire. Indeed he had when he was a boy. Ian moves to double-page spreads as grandfather begins to tell the tale of the great fire. 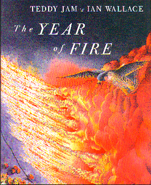 The reader can practically feel the heat off the page as Ian employs flaming orange to depict the conflagration. A whole forest burned down, grandfather tells his graddaughter. Trees exploded. Farmers tried to save their farms. Nothing could stop the blaze but rain. The fire eventually died out and the forest grew again. The starkness of the winter white following the fire is a startling contrast. That was long ago, grandfather says. The fire is gone and only the story remains, to be passed on to the next generation. Groundwood/Douglas & McIntyre, 1991. 0-88899-143-6. April Moth lives alone with her dog, Mr. Kneebone, in a run-down dwelling in a big city. When April finds one more rat in the cupboard, it is one rat too many. Off she goes with Mr. Kneebone and her cart filled with her belongings in search of a better living place. Though the city is big and full of many different buildings, the old woman cannot find a suitable and affordable room and no one seems to care. At the end of the day, Mr. Kneebone, April Moth's only friend and companion, leads her to a park where they discover a small cave, just big enough for two. In this picture book, Ian's pen and ink illustrations with water colour show, in varying shades, the different aspects of a city, from sleek and modern to grey and squalid. In contrast the calm, uncluttered, delicately depicted green park is a peaceful refuge. Under the scorching African sun, the animals walk in search of food. As they reach a lone tree in the middle of the dry, vast plain, the animals long to eat its delicious fruit. But try as they might, none of the animals can reach it. An old tortoise tells them that only by knowing the name of the tree can its fruit be reached. 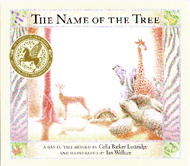 Who will go and ask the king the name of the tree? First a gazelle, then an elephant go, but the way is long and far and they both forget. Finally a small, young tortoise goes, and he does not forget that the name of the tree is Ungalli. As all the animals chant "Ungalli" around the tree, its branches lower. Now the animals can taste the fruit which smells like all the fruits of the world. Ian's use of pencil crayons to create the pictures perfectly depicts the dry, hazy feeling of the African desert. The white light and empty spaces on the page give the impression of the rising heat and the baking sun. The invisible grain of the paper beneath the colours also adds quality to the texture giving substance to the sand dunes of the wide plains.